Precision, artistic, and permanent marking on many different surfaces. Laser Engraving will never replace traditional scroll work from an artisan. 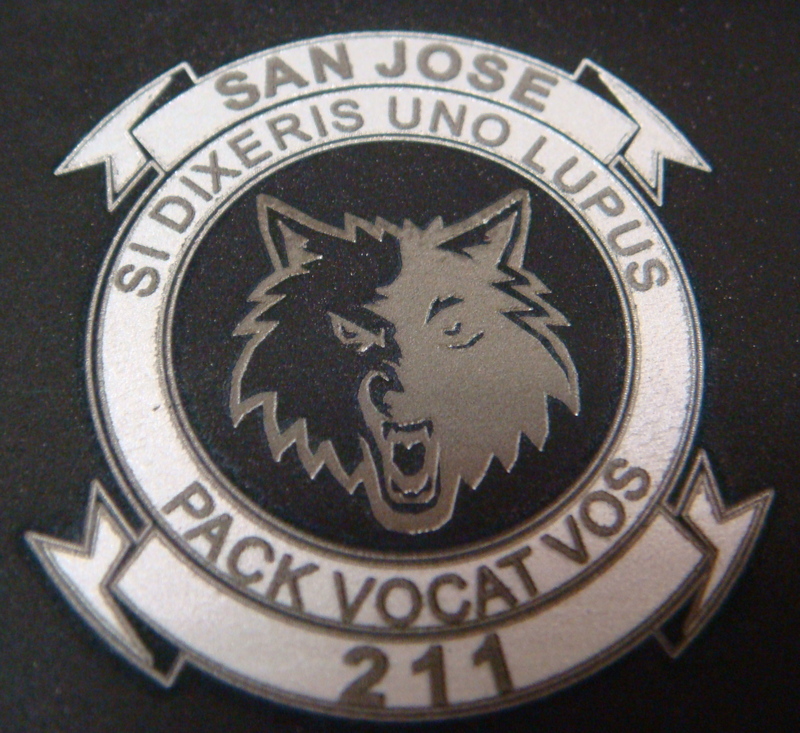 Yet laser marking adds the ability to rapidly make custom designs. Adding pulse control from MOPA Fiber Lasers allows for variable depths, remelts, textures, and contrasts. 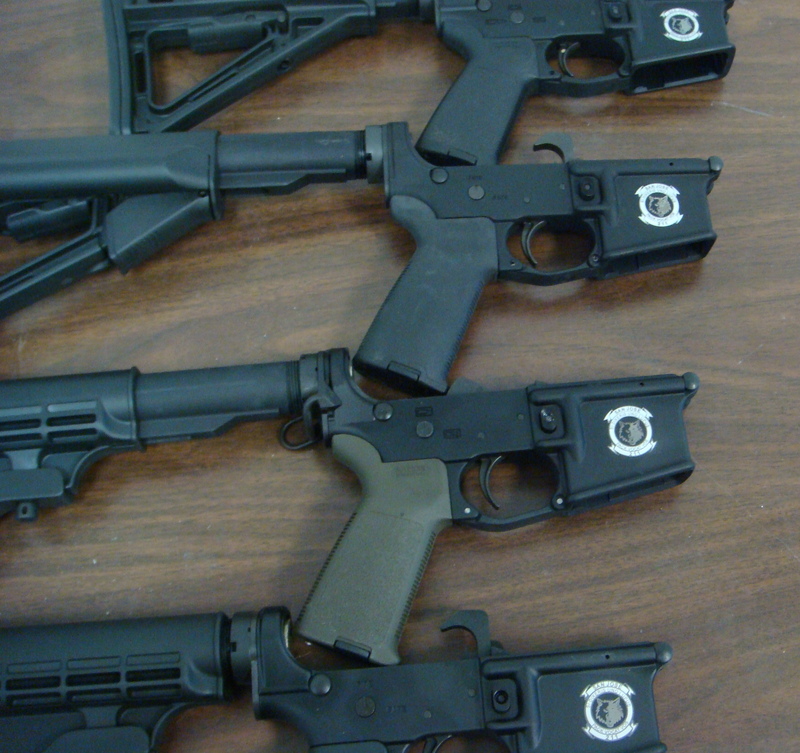 AR-15 Receivers are marked with a the “211” Division logo of the SJ Police. 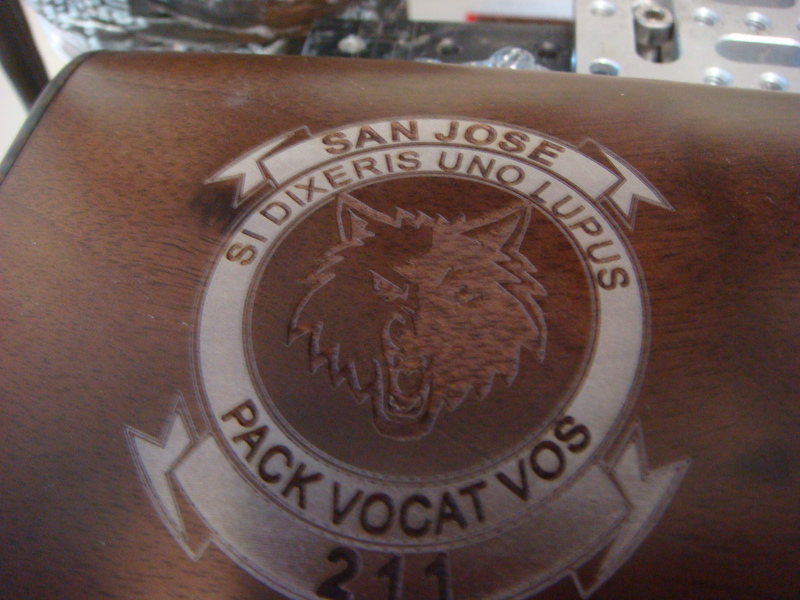 The same logo was etched onto a wood stock for a gift for the retiring Lieutenant as well as the M1911 belonging to the Desk Sergeant. 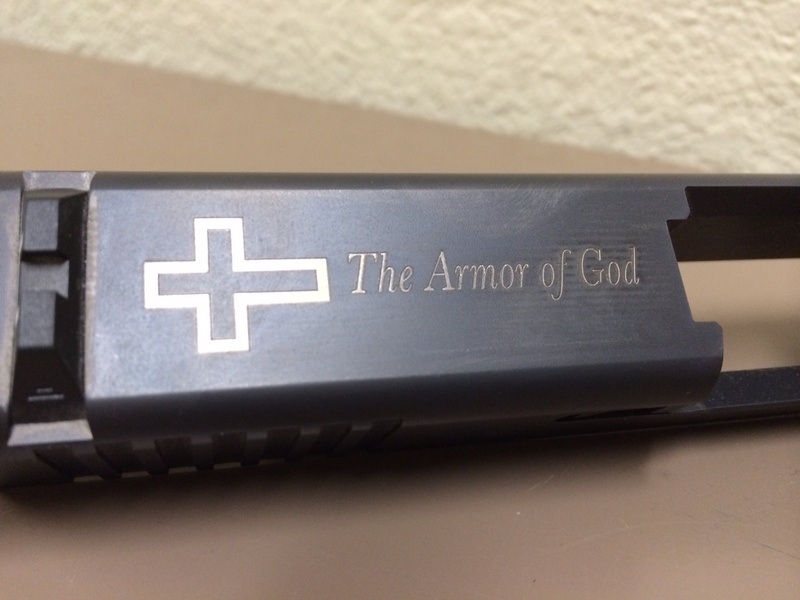 And note the Cross on the Glock21 slide. Zoom in on the photo and note that the engraving is both deep and smooth. This is due to the versatility of MOPA wave forms which can create a clean surface that does not attract rust. Laser Mark’s Company has all the tools! 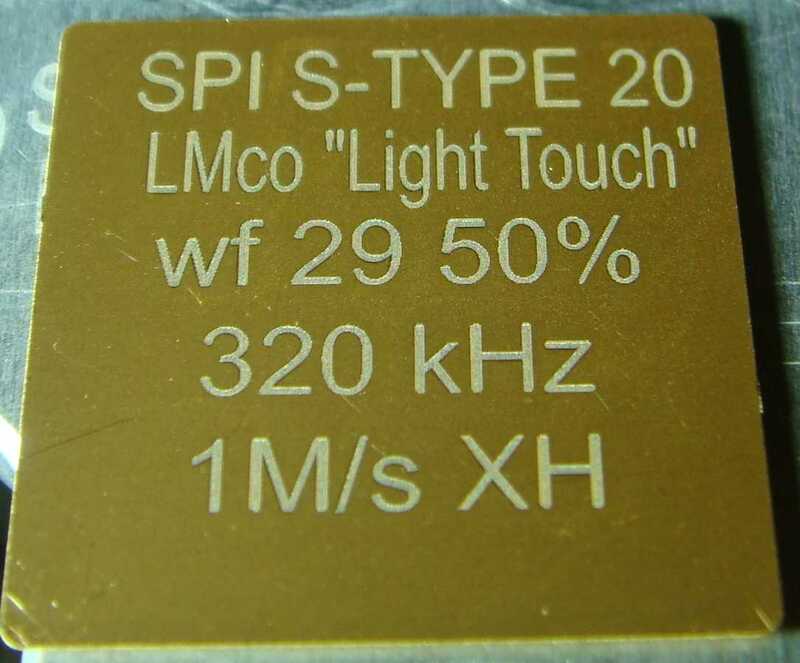 Categories: customer laser engraving san jose, laser engraving san jose, laser engraving service san jose, laser engraving services san jose, laser engravings, laser etching san jose, laser etching services san jose, laser marking san jose, lasermark san jose, marking methods san jose, Uncategorized | Tags: custom laser engraving san jose, Custom Laser Marking, Custom Laser Processing, Gun Engraving, laser engraving san jose, Laser Mark's Company, Laser Marking California, Laser Marking Silicon Valley | Permalink. Categories: custom clean room vertical part marker, customer laser engraving san jose, laser engraving san jose, laser engraving service san jose, laser engraving services san jose, laser engravings, laser etching san jose, laser etching services san jose, laser marking san jose, lasermark san jose, marking methods san jose | Tags: Custom Clean Room Vertical Part Marker, laser engraving san jose, laser etching san jose, laser marking san jose, lasermark san jose | Permalink. Laser Mark’s Company has wide field F-theta lenses combined with precision motion control. Together we can create marking programs for high volume processing. Time is money and with the right kind of fixturing, enable marking costs to be greatly reduced. Laser Mark’s Company has 6 MOPA Fiber Laser systems in addition to Single Mode 2.2mJ high power DPY and a Galvo CO2. Come to Laser Mark’s Company to develop a process to meet your needs. Categories: customer laser engraving san jose, laser engraving san jose, laser engraving service san jose, laser engraving services san jose, laser engravings, laser etching san jose, laser etching services san jose, laser marking san jose, lasermark san jose, marking methods san jose | Tags: custom laser engraving san jose, laser engraving san jose, laser engraving service san jose, laser engravings san jose, laser etching san jose, laser marking san jose, lasermark san jose | Permalink. Yes, the old Lee lasers have been put out to pasture. (Actually they were sold off to a research institute at a university). 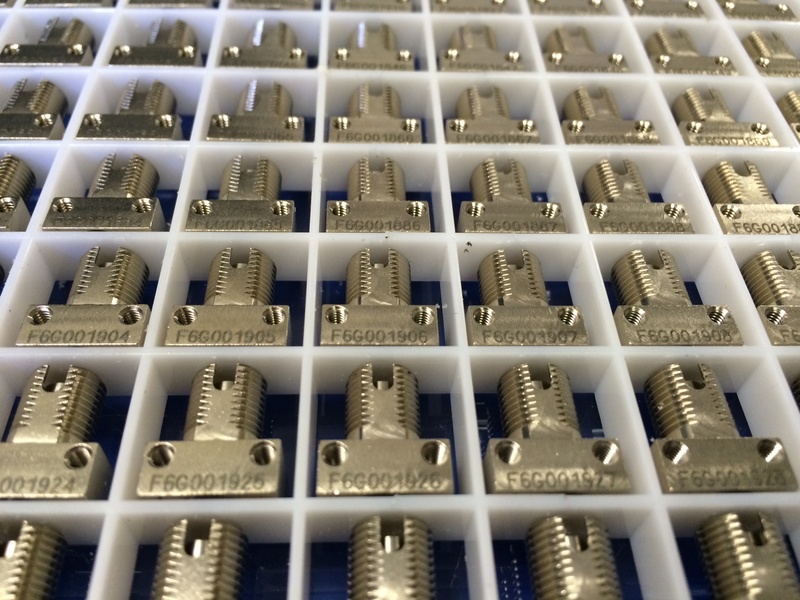 All our 1064nm lasers are now solid state. This means no more variability in the quality of the mark as the lamps degrade over time. All Laser Mark’s Company machines are now maintenance free. That eliminates down time and makes pulse to pulse stability issues a thing of the past. All laser pulses now are clones of each other. We are the only job shop in Silicon Valley to be fully solid state in 1064nm and our CO2 system is sealed as well. Come to Laser Mark’s Company for reliability and quick turn production. Categories: custom clean room vertical part marker, customer laser engraving san jose, laser engraving san jose, laser engraving service san jose, laser engraving services san jose, laser engravings, laser etching san jose, laser etching services san jose, laser marking san jose, lasermark san jose, marking methods san jose | Tags: custom laser engraving san jose, laser engraving san jose, laser engraving service san jose, laser engraving services san jose, laser engravings san jose, laser etching san jose, laser etching services san jose, laser marking san jose, lasermark san jose, marking methods san jose | Permalink. After 4 years working in the worlds finest laser labs, Mark Brodsky returned to rebuild, refresh and fully renovate Laser Mark’s Company. His goal will be to update the company with the best tools in the industry. New hardware; New Software; and perhaps soon a new facility. We are adding new laser technology previously available to just the Fortune 500 companies. Laser Mark’s Company is the only Job Shop in Silicon Valley with MOPA Fiber technology. And we have Four of them!!! 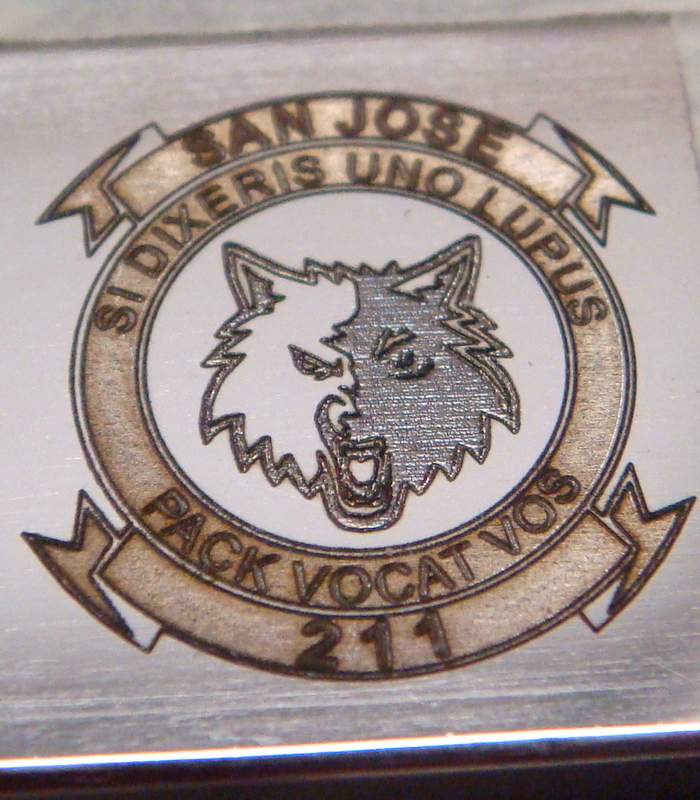 Categories: custom clean room vertical part marker, customer laser engraving san jose, laser engraving san jose, laser engraving service san jose, laser engraving services san jose, laser engravings, laser etching san jose, laser etching services san jose, laser marking san jose, lasermark san jose, marking methods san jose, Uncategorized | Tags: custom laser engraving san jose, laser engraving san jose, laser engraving service san jose, laser engraving services san jose, laser engravings san jose, laser etching san jose, laser etching services san jose, laser marking san jose, lasermark san jose, marking methods san jose | Permalink. MOPA fiber opens the door to many competitive advantages for etching, polishing, trimming, marking, engraving, serializing, micro welding, thin metal cutting and coloring on all sorts of materials. Mr. Laser has written an article for Optics and Photonics News to describes this exciting new technology. Click on this link http://www.osa-opn.org/Content/ViewFile.aspx?id=13264 to read the full article. As soon as jobs are complete, we now email you with the invoice containing PO and process details. This will be the quickest and most secure means to provide this alert for your drivers. It is the goal of Laser Mark’s Company to be your JUST-IN-TIME laser process provider. Over time we hope to have all our customers Accounts Payable emails on this system as well. This will lower processing costs for everyone and contribute to greener manufacturing. Please make sure we have the best email addresses for your convenience.